If you thought that it was all about the motion of the…uh…potion, think again. Size does matter. First published in Prestige Magazine (October 2012 edition). Every year the authoritative Drinks International publishes a supplement called The Millionaires’ Club. To the pundit this is something of a bible – and accordingly I read it religiously. It’s a snapshot of an intensely gladiatorial arena at the end of the annual “games”, documenting the performance – measured in millions of 9l cases – of the world’s big-time spirits brands. In order to crack the nod a brand must post minimum annual sales of that magical thousand thousand, hence the name. You might ask yourselves why this should matter to you. Those of us who consider ourselves to be fierce individualists would probably insist that we make choices to which we are innately suited, rather than paying any attention to what the unwashed masses are consuming. Or in other words – when it comes to liquor – we should drink what we like rather than worry about what others are drinking. It’s a simple fact of life however that popular preference has significant sway on our own. We are susceptible to a large extent, like it or not, to the influence of the world around us. There is some sense after all, unconscious or otherwise, in recognising the value of something that has been evaluated and accepted en masse. It is the ultimate endorsement, or so I console myself when falling prey. Furthermore there’s also an undeniable pull to the beholding of scale: elephants, monster trucks, million case vodkas, and much other such oversized phenomena all offer a certain voyeuristic fascination, especially when they’re pitted one against the other. Millionaires then is well worth a gander. So, what’s big and getting bigger? What’s out there – of significance – about which we might not know? Do we need to re-evaluate our repertoires? I was seeking out and enjoying Grey Goose a good few years ahead of most fellow South Africans, thanks to Millionaires. Do you know that Ballantine’s Scotch whisky – which is completely under our local radar – is the world’s third best-selling whisky? And that’s including whiskeys! What other tricks out there might we be missing? There’s only one thing for it – here are the highlights of 2011. A quick note first though: Millionaires categorises a brand as either global, regional or local, depending on its prevalence. Global brands are those with wide reach and appeal. Local brands are limited to just a few markets, or in many cases just a single market. These are typically value-for-money brands whose success can largely be attributed to pricing, or culturally-specific tastes. Regional brands fall somewhere in the middle. I think we have enough Romanoff vodkas and Wellington brandies all of our own so I’ll be focusing on global brands, with the odd passing glance at a few regional brands and at one lone local brand. All figures quoted represent millions of cases. You should know: Remy Martin declined to participate and did not submit any figures for 2011 – its volume for 2010 was 1.65. Courvoisier, the smallest of the four dominant cognacs was also the fastest growing last year – adding to the previous year at a rate of 11,7%. The Jarnac producer built this growth with the launch of a slew of age variants as well as other line extensions, notably C by Courvoisier – a bold, some are saying revolutionary, double-matured cognac with a “full-bodied, intense flavour profile”. It is targeted it seems at the gangsta rapper brigade…and associated wannabes. Word up. You should know: Smirnoff continues to consolidate its solid position – it has for some years now been the world’s largest global brand. Meanwhile Ciroc, the ultra-premium grape-based vodka, has crested a million cases and was last seen passing the 1.5 mark, climbing a rate of 66.7% thanks to the efforts of megastar rapper and brand ambassador Sean “P.Diddy” Combs. Ciroc may technically be classified as a local brand (very unusual – given its premiumness), because its volume is almost exclusively concentrated in the US, but on evidence of this performance it won’t be for very much longer. Around the world people are also increasingly calling for Ketel One and Poliakov, two premium vodkas that have been growing steadily during the past five years. You should know: Rum continues to be dominated by the mix-it, party brands. Only Appleton, with its credible portfolio of aged rums, is giving any hint of what might be to come. William Lawson’s posted incredible growth of 35,5%. Is this the mass discovery of a formerly underappreciated brand? There are suggestions that a pre-duty stocking in the massive French whisky market may be responsible, but time will tell. If this is the case it’ll be corrected in next year’s figures, but it might be worth finding a bottle in the interim to see if there’s any merit to the fuss. The introduction of flavoured “bourbons” such as Red Stag has been a big hit and largely accounts for the strong movement from Jim Beam and Wild Turkey in particular. Jameson continues its long term surge, growing at an impressive 19,2% off an already large base. Where though are the other Irish whiskeys? The most monumental news however is the entry of the first single malt into the club (Glenfiddich of course). Malt still plays a distant second fiddle to blends, but this signals a bit of a shift – in perceptions if not serious volumes yet. Hopefully the supply can keep up. You should know: Premium brands rose, whilst standard brands stayed static or sank. The G and T set are packing their bags and setting sail for Bombay, with sales of the blue bottle leading the charge for the second year running at 7,9% up. 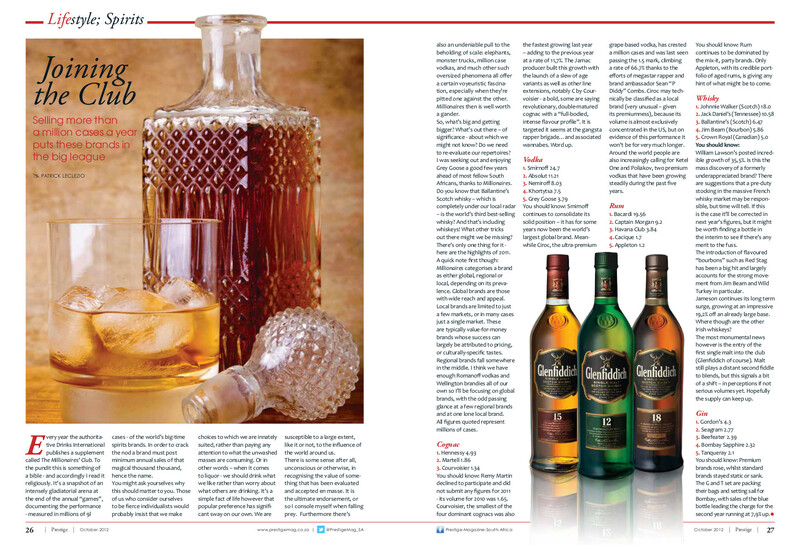 This entry was posted in Spirits column and tagged Distilled spirits, Glenfiddich, Prestige Magazine, Rum, Whiskey, Whisky. Bookmark the permalink.